Iran was within its international obligations when it enriched some of its uranium stockpile earlier this month and should not be subjected to U.N. sanctions over its nuclear program, its parliament speaker said Thursday. Ali Larijani, speaking in Tokyo, said Iran has been unfairly singled out for pressure and threats by the United States over its development of nuclear technology, which he said was peaceful and intended solely to provide a source of energy, The Associated Press reports. "I think the way out of this situation is responsible behavior by Iran itself," AFP quoted the Russian president as saying in an interview with the French magazine Paris-Match on Thursday. 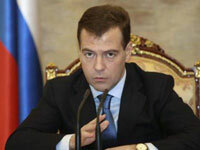 "We believe that Iran's nuclear programs should conform to the demands of international organizations like the IAEA [International Atomic Energy Organization], and also that work in this area should be transparent for oversight," Medvedev went on to say, PRESS TV. According to RIA Novosti, there is no hard proof that Iran is working on nuclear weapons, but Tehran has to clarify several key issues on its nuclear program to avoid fresh international action, Russian Foreign Minister Sergei Lavrov said on Thursday. Iran's recent move to begin enriching uranium to 20% sparked a new wave of international criticism, with the U.S. leading calls for new harsher sanctions against the Islamic Republic. "There is no evidence that Iran has made a decision to produce nuclear weapons," Lavrov said in an interview with RIA Novosti.